• Psalm 1: 1-4, 6. The Third Thursday of Lent; and, the Commemoration of Saint Benedict, Abbot. 8:59 AM 3/21/2019 — The translation of the Holy Scriptures used in the Roman Missal tries its best to put the words of our Lord into common American English, which is fine; but, every once in a while you come across a subtlety in the original Greek or Hebrew which is lost in the attempt. Case in point: the opening verse of this passage we just heard, the Parable of Lazarus and the Rich Man. 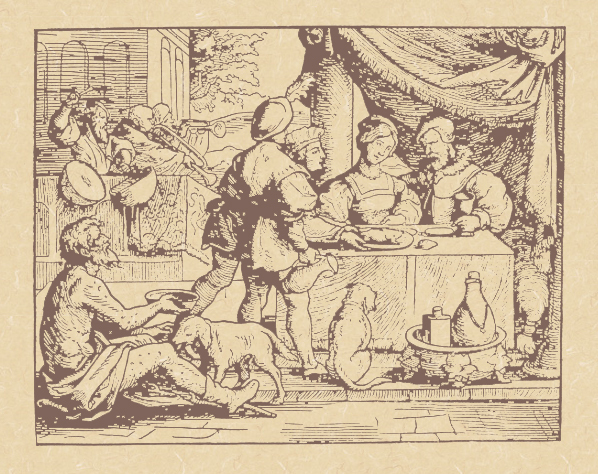 What we heard was that a rich man had a certain beggar "lying at his door." What it actually says, in fact, is “a certain beggar … ἐβέβλητο πρὸς τὸν πυλῶνα αὐτοῦ εἱλκωμένος (had been placed at his gate)”, the Pluperfect Passive of βάλλω, literally, "had been placed by being thrown"; which implies that this was not a chance encounter: the beggar didn’t just show up one day; he was put there deliberately for a specific purpose by someone who is not named, which, in the Bible, means it was God, which is evidenced by the fact that we are told the beggar's name; if the one telling us the story knows his name, it's because the one telling us the story put him there. 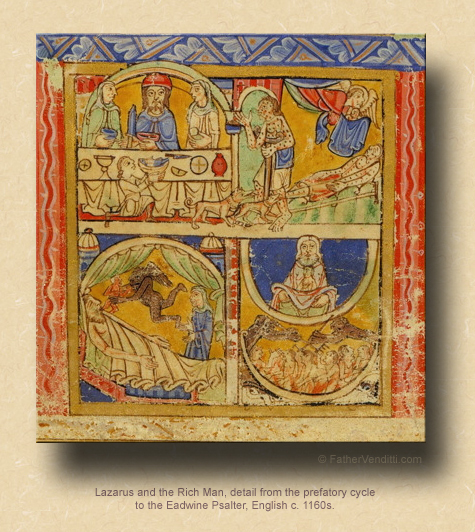 So, the implication is that Lazarus was put there by God as a test, to force the Rich Man into making a moral decision, which, when you think about it, is crucial to understanding the meaning of the passage. The rich man, like most rich people, has used his wealth to isolate himself from what is ugly in the world around him, as rich people often do. But it doesn’t work, because the beggar, Lazarus, is “laid at his gate,” as our Lord puts it. Which puts the rich man in an awkward position; because, now, in order to continue to isolate himself, he has to pretend that Lazarus isn’t there;—he has to literally step over him whenever he walks into his house—he has to ignore him, which he does, for which he ends up paying the penalty by being sent to hell. Now, there are two points that are worth noticing here: first, the obvious fact that the rich man’s retribution, and consequently Lazarus’ reward, do not come in this life; they come in the next, when Lazarus is sent to heaven and the Rich Man goes to hell. It’s an important point to keep in mind, especially when we run into people who are having a hard time and who say, “I lived a good life; why is God letting this happen?” They are forgetting that reward and punishment do not happen here. The Rich Man is very remorseful for how he’s lived and for ignoring the beggar at his gate, but by that time it’s too late: any opportunity he may have had to change his life is gone. And there occurs a very interesting—and sobering—exchange between them. The Rich Man, in the fires of hell, realizing that there’s now no way out of his predicament, asks Abraham to allow Lazarus to dip his finger in water and cool the Rich Man’s tongue. It’s an exact reversal of what was going on before they both died, when Lazarus was begging for a scrap from the Rich Man’s table. But it isn’t to be, as Abraham explains to the Rich Man that there is no communication between heaven and hell: Lazarus can’t reach across the gulf to cool the Rich Man’s tongue; the judgment made against him at the time of his death is final. But what’s really remarkable—to me, anyway—is that, having had this explained to him, the Rich Man lapses into a fit of charity: in the midst of this unbearable torment, brought on, of course, by his own neglect, the Rich Man wants to spare his brothers, who are also rich, from the same fate. He asks Abraham to send Lazarus to them, so they can be warned to change their ways before it’s too late. It seems—on the surface, anyway—to be an extremely magnanimous gesture, and it occurs to us, I think, that Abraham should look favorably on such a request. After all, it’s probably the first time in this Rich Man’s existence that he’s thought of the needs of others rather than his own. But Abraham rejects the idea. He tells the Rich Man that, even for his brothers, it’s too late. And the reason we should find that so sobering is because his brothers are not yet dead. Presumably they still have a chance to change their ways, but they are not to be permitted this warning. It seems so unfair, but then Abraham explains why: they have Moses, they have the prophets, they have the Scriptures; they need nothing else. Everything they need to learn what they must do to be saved has already been provided. If they choose not to heed it, it is their own choice and their own fault. There is a second point about this parable, as I said, to which I would draw your attention, and it’s a point that was made in the fifth century by Saint Cyril of Alexandria in his commentary on Luke’s gospel. He points out the fact that the Rich Man is never named by Jesus in the parable, He simply calls him “a Rich Man”; but the poor man, as we noticed already, He mentions by name. Why? Because the Rich Man, lacking in compassion and being totally unconcerned about the state of his soul, was nameless in God’s presence. And then he quotes Psalm 15, verse 4, in which God says, concerning those who do not fear Him, “I will not make mention of their names with My Lips.” It’s a chilling statement about the harshness and finality of God’s judgment. It is so easy for us, day after day, to come to church, sing the songs, say the prayers and go home to all the other “important” things that occupy our lives, having fulfilled whatever obligation we think we're fulfilling for another day or another week. And if it's one of our Lenten resolutions to try and make it more than that—and I think we all can agree that would be good—then that’s an adjustment that has to be made by each one of us in our own hearts. It’s not up the priest to inspire us, although if we have a priest that does that for us it’s helpful; but ultimately it’s up to each one of us to decide what we’re doing when we’re here: what we’re thinking about, what we’re praying about, whether we are truly listening to what’s being sung and said and examining our lives in light of it. No one is responsible for doing that for us. 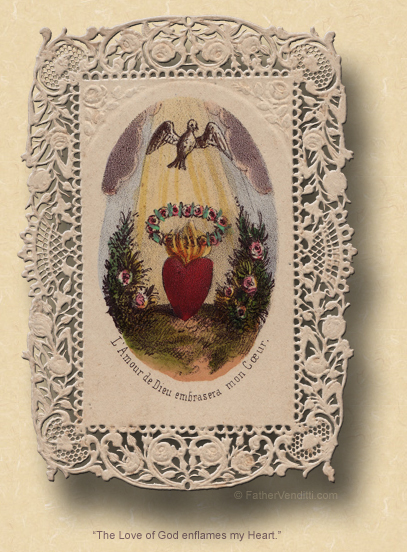 As Cardinal Newman once said, “I can no more think with thoughts not my own than I can breath with lungs not my own, nor can I pray [from a heart] not my own.” Everything that we need to be inspired and consoled, to be sanctified and saved has been provided to us by Christ through his Church. What we do with it is entirely up to us. * Because Lent began on a Wednesday, today is the third Thursday. Cf. the post here under the heading "Hey, aren't you off by a week?" for an explanation of how the days of the liturgical calendar are rendered on this site as opposed to how they are designated in the Roman Missal.